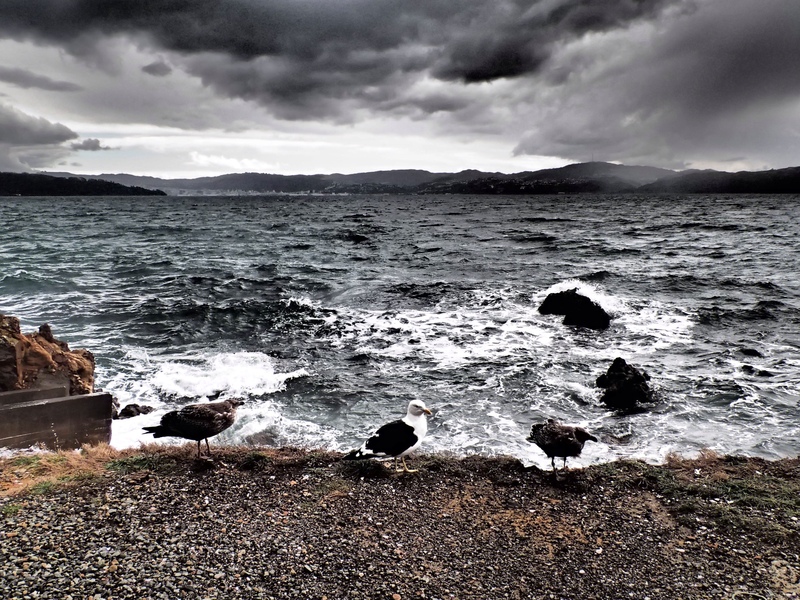 Wild Windy Wellington – Part 6 – & A Brief Grief Glimpse. Island view on the way to Days Bay. I know these part series are getting out of control – I just have so much to write about. Once again so much has happened in the last few days, and my urge to write and photograph continues to be at an all time high. For me, travelling to new places provides so much inspiration to write and photograph my surroundings. Every day I am exposed to new stimuli, and this makes me feel very excited. My eye for photography is improving, everywhere I go, I see a potential image, how I can get the right angle, snap a burst of colour. I love pursuing these passions, and I hope you are also enjoying my creative exploration from my experience. I realised today, I feel a strong urge to capture beauty around me, to sometimes replace images in my mind which are not so beautiful. Frequently, my mind drifts to a time in my past when my darling Mum was fading before my very eyes. She suffered a tragic decline in her final weeks, and became a paralysed emaciated woman, succumbing to the cancerous mass growing out of control in her once vibrant, energetic and strong body. These images haunt me. Memories return at random times; as I am falling asleep at night, or in the midst of a task, my mind will be zapped by dread, shock and sorrow. I will suddenly remember the feel of her paper thin skin, the tiny shape of her wrist, the protruding veins in her hands, the steep curve in her back. These fine details seem to exist in an ethereal state in my mind, mixing with images as she was before she was sick. They fight for space with the memories of death, the final frozen pose, the stiff frozen finality. Blend this with recollections of the warmth of her body, the smooth softness of her skin, her skinny arms and wrists, her watch increasing in looseness as the weeks inched by. Memories of good and bad are intertwined my mind racing back and forth. When she died, one of the most horrifying of memories was witnessing her final breath. Her chest remained in place, never again to rise and fall naturally with each passing breath. So strange. I had never seen someone die before my eyes before. Although I felt privileged to be with my Mum as she took her last breath, holding her hand, encouraging her to go, I knew she had held on for too long. She was a stubborn and strong women in life, and the same could be said for her last dying days. This post wasn't meant to be about images of my dying Mum, grief has reared its ugly head. It is the ugly truth, and it is real, therefore it is not ugly. I feel relief to write these memories down, hopefully I can set them free and I can retain only the better, healthier and happier thoughts of my beautiful Mum who I loved and cherished and miss so much. Now where was I? About to tell you about my amazing day here in Wellington. I travelled by ferry to Days Bay, a quaint little place across the harbour. I loved every minute of my day trip. I was in photo heaven and snapped at least 300 shots. Luckily I condensed them to the best few. If you like my photos please check me out on Instagram Ozolins813. One day I aim to publish a photo travel book. So if you know of anyone interested in publishing please let me know. 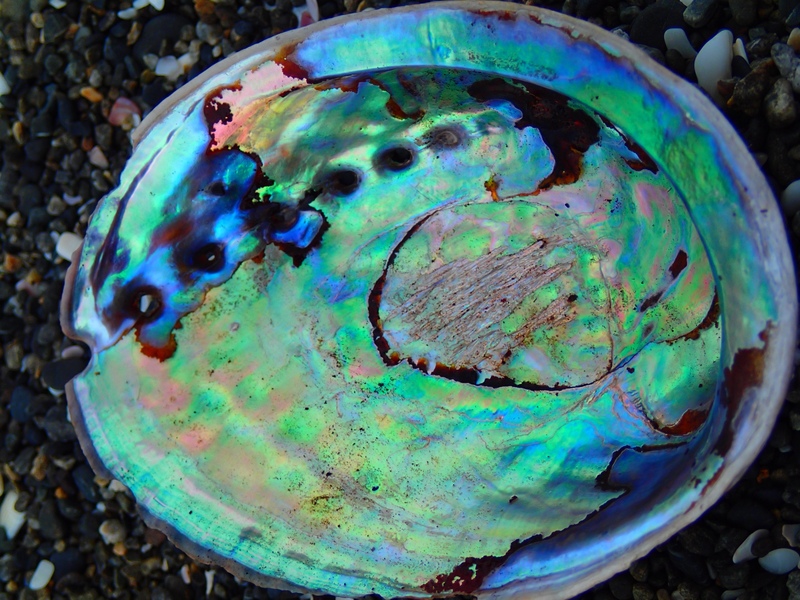 Beautiful bright coloured shell found on beach near Wellington. I digress…again. On arriving I set out on foot traipsing around this small little cove of Days bay. I found brilliant blue and purple shells on the beach, oversized seagulls and a bright yellow boat, all perfect centrepieces for my art. I love these moody seagulls. I wandered around the coastline head first into blustering cool wind, aiming to reach the township. There I found cute art galleries, cafes and shops. I love to explore art galleries on my travels, so this was perfect. I found some great works and picked up pamphlets for my scrapbook. 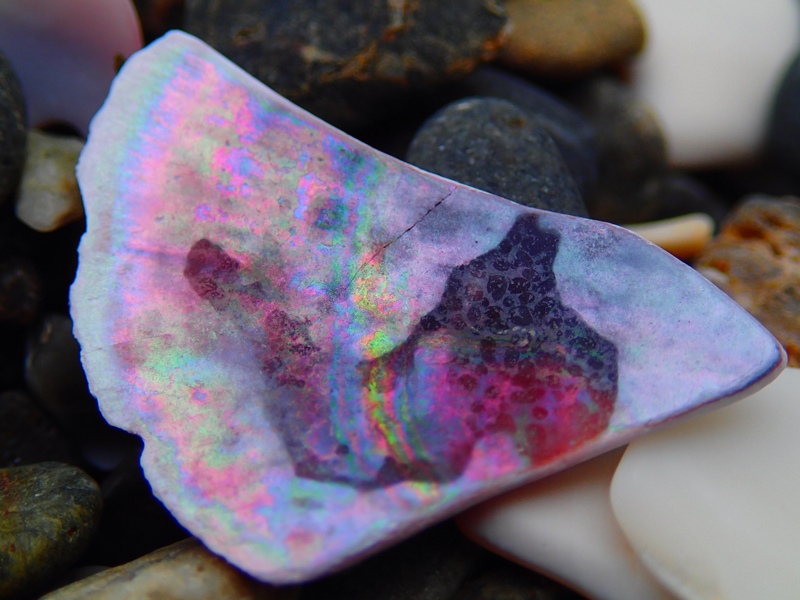 I stopped for more shell photos on the pebbly beach, the abundance of bright colours was mesmerising. I am so allured by bright crimsons and peacock blues, colour is a big part of my life. It makes me feel good, my bright colourful perspective, I like to apply to all aspects of my life. Before I boarded the ferry, some local kids were jumping off the jetty, frolicking around like seals in their black wetsuits. Here is a glimpse of their acrobatic action in the photo below. The sea was rough on the return journey, the sway and swish of the ferry through the water made it hard to walk around too much. I kept to the top deck, braving the freezing cold air, cool salt spray. Breathtaking views of the harbour and surrounding Islands, and more photographic opportunities made the rough splashing ferry sea crossing worthy. Kids showing off, stunts off the jetty! For my last night in town, I met my friend for dinner, where we went for an upmarket and very funky Asian fusion meal at a place called “Chow”. Ginger and lime gyoza and coconut and prawn dumplings for starters, followed by roast vegetable and coconut curry; we both felt very satisfied by our cuisine choice. The day was complete with liquorice tea and dark peppermint chocolate as a parting farewell to my Scottish friend. It was good bye for now, I know our paths will cross again in another place and time. This is the beauty of travelling friends; there will always be more chances to meet again. Finally my time in Wellington had come to its end. I had thoroughly enjoyed my time in this bustling, funky, retro city. Windy it proved to be, chilling winds and lashing rain, but also hip and happening, loads of eateries and bars, scenic harbour views and an abundance of day trips. I will definitely be back, for more windy Wellington wildness. Hope you have enjoyed my trip review to Wellington, please like or share my post with others you think might also enjoy reading about my travel insights and photographic adventures. “A crisis is an opportunity riding the dangerous wind.” – Chinese proverb. Reading first about your descriptions and then the memory of your mother was very powerful. I think it is good to heal with writing and new challenges and to take time to do this. I am sure one day you will be at ease with the memory of your mother and with the times before she became ill. Take care. Beautiful and moving. Thanks Anita. 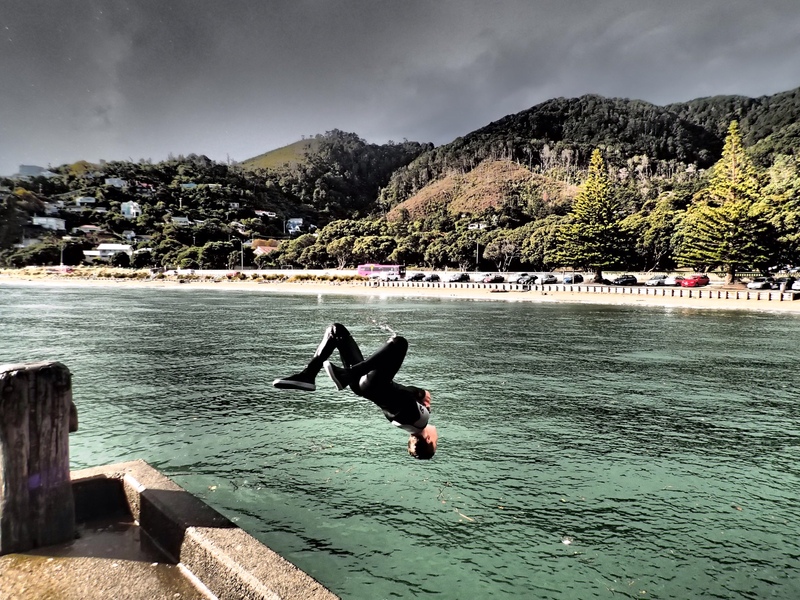 ← New Zealand Part 5 – Cambridge and Wellington.